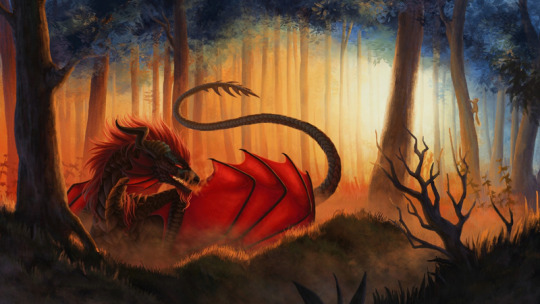 This Dragon was as I expected a Dragon to be: for it’s traits were of a Western nature; who appeared to be “perfectly at home”, within this Forest of Fire. A Forest Fire that left no doubt within my mind, as to who it was that breathed this Fire – for flames flicked around this Dragon’s teeth. It’s body was “scaled in darkness”, thick armour plates that glowed in the colours of this Fire. It’s tail was long and curled, appearing as a “whip” – as this Dragon nestled in the barren. This Dragon’s wings were “bathed in red”, as if a “shield of fire” – helped guard this Dragon and his hoard. What was the Dragon looking at? It seemed to me that this Dragon, was looking at the “burnt out stump” of a fledgling tree. Perhaps it was, that this Dragon – admired his “handy work”. For in orange brown, did the Trees of this Forest – appear to be ablaze. The grass of this Forest, writhed in the heat; as the wind of this Forest, turned up the heat. At it’s heart sat the Dragon, and the wisdom of Fire! For it was indeed, that this Forest Fire Dragon, had a “wink in his eye”. The browning of the autumn leaf. The crackle of the autumn leaf. The blanket of the autumn leaf. For it was foreseen, that this Dragon – helped drive the nature of this Wood: from summer sun to autumn gold. This entry was posted in Fantasy Dragon Art and tagged adventurer, autumn, dragon, dragon hoard, fantasy, mythical creatures, western dragon. Bookmark the permalink.